When you’re trying to get your health back on track, there are many ways to detox your way to feeling better. The best way to flush out toxins, however, is simple: lots and lots of water. But you don’t have to drink it plain; you can add a little flavor as well with these delicious (and detoxifying) additions. Add all of these to a large pitcher or bottle full of ice and water and drink throughout the next day for an effective way to detox! It helps to let these pieces soak overnight in your fridge to let the flavors meld. Lemon: Lemon water makes for a powerful detox drink; lemon juice helps to cleanse and alkalize the body. Add one thinly sliced lemon to a large pitcher, or squeeze fresh lemon juice into your glass. Mint: Mint adds a touch of sweetness without the sugar to your water, and it also helps settle your stomach and aids in digestion as well. 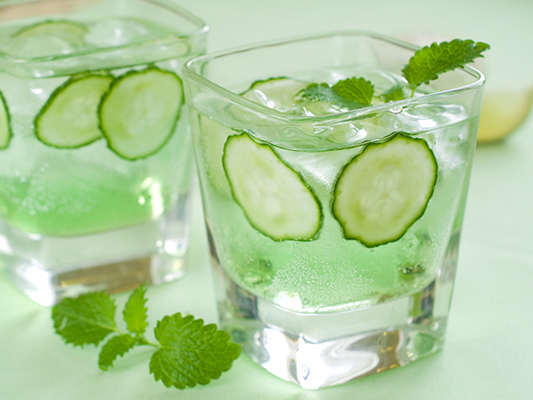 Cucumber: Cucumber water isn’t just for spas. Adding a few slices of cucumber to your water makes for excellent rehydration, and cucumber also contains anti-inflammatory properties. Ginger: The spicy root helps cleanse out your system, aids in digestion, and settles your stomach. A little goes a long way, so start with a few thin slices or grate a tiny piece into your water and taste before adding more as necessary. To make one serving of detox water, add three to five slices of cucumber, half a lemon, and a few sprigs of mint leaves to 24 ounces of ice-cold water. 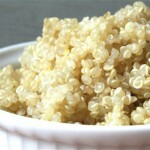 You can also add sliced peeled ginger (about a one-inch piece of ginger root, or to taste) for a spicy kick.